This resource features the general description of a network of caves and sewers under a big city. 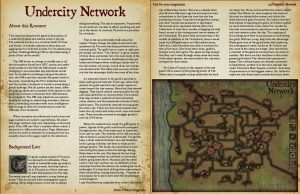 The network is home to a criminal Guild of Drow and Kenku. 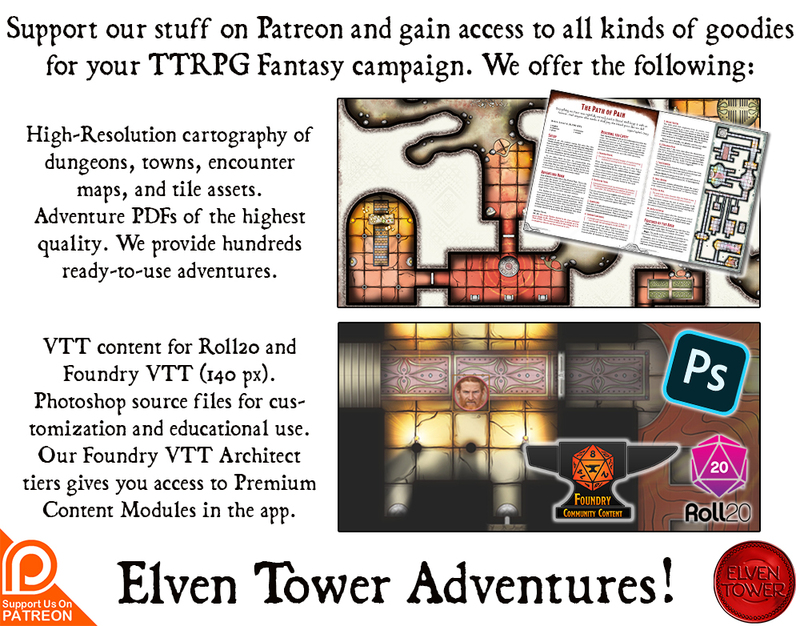 It includes adventure ideas that are appropriate for mid-level (Levels 5 to 9) adventuring parties. Challenge Rating (CR) is calculated using a party of four as the model. The great coastal capital of Firannia is a pinnacle of civilization. Thousands of townsfolk wake up early in the day to work. And they have to do it; Firannia is a fierce metropolis with little patience for the lazy. You work, you sell, you entertain, or you better go home. They do not call it the unstoppable cog for nothing. Every single person in the city is always doing something. The city is expensive. People who do not work are not able to afford anything and end up in the slums. In contrast, Firannia is a paradise for criminals. That is the uncomfortable truth about the capital. People change the subject and evade the questions but Firannia has deep problems with a criminal guild. The guild has no name or sigil, people simply call them “The Others”. A great number of drow elves and kenku form the main body of the organization. It is common knowledge so they get looks and whispers when walking in plain view in the city streets. Of course, not all drow and kenku are involved with The Others but so many of them are that the stereotype holds true most of the time. An important factor in the guild’s success is their underground network. Years ago, when they started, the guild used the city’s sewer system to move around the city unseen. After that, they started digging. They found natural caverns under the city and expanded them to connect them. The tunnels they dug created a network of interconnected caves, sewers, and the basements of some of their safe-houses. 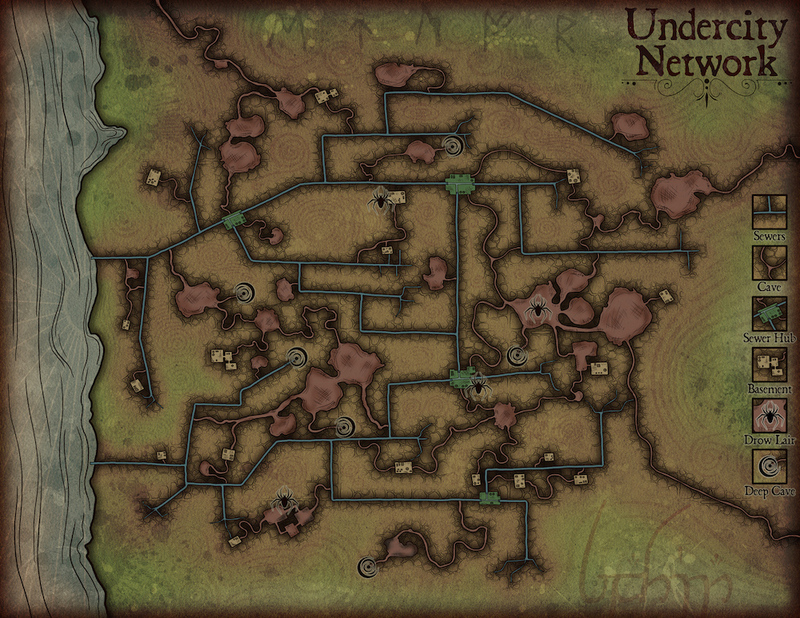 The undercity network encompasses the entire city. There are even three tunnels that leave the city and travel miles north, east and southeast. These tunnels are used to smuggle goods in and out of Firannia. When the network was ready the guild grew in power. Agents of the guild could travel unstopped throughout the city. From basement to basement, from cave to cave. The entirety of the city was available to them to access from underneath. The guild’s boss, a drow matriarch known as Lady Knuckles, hired a group of kenku low-lives to work on the sewage system. The kenku do maintenance work and unclog the pipes so that the sewage always flows down to the sea. She figured that as long as the sewage worked as intended no one would bother going down there. Humans and the other races in the city’s surface are so involved in their everyday lives that the sewers are nothing but an afterthought. It is that kind of thing that only comes to their minds when it stops functioning. Firannia is not popular for it, but it does have the best sewage in the kingdom. Lady Knuckles was originally born in the Underdark city of Menzoberranzan. She was a nobody when she left there fifty years ago but she wants to have connections in the drow city now that she has something of value. Thus she hired goblins, kenku, and other monstrous peasantry to dig deeper. Six tunnels were expanded downwards to the Underdark. It took them months of digging but they found access to the underground cavern system of the Underdark. The place they accessed was in the middle of nowhere in the Underdark, about a week away from Blingdenstone and Menzoberranzan. After this, Lady Knuckles was able to increase the size of her team. She hired other drow, goblins, duergar and a few ogres. The ogres are big enough that they can’t move through some caves and most of the sewer system, but some exits to the city were enlarged for that reason. Sir Gallard Tumain is the captain of the city guard. He is aware of the growing power of The Others but is incapable to stop them with his limited resources. He is convinced that the watch cannot defeat The Others, he even suspects that some of his men are taking bribe money and inform the drow about the guard’s moves. Sir Gallard decided that instead of opposing the guild, he’d better gather as much information as he could. For months he has lead reconnaissance operations in the sewers and cave system under the city. The mapping of the underground level is paramount to confronting the guild. Without a map, they have the advantage. Many good men of the guard have died exploring the underground caves. As far as Sir Gallard can tell, most of the caves are empty. Only used when a member of the guild is moving from one place to another. But there are four locations in the underground grid where The Others have permanent bases. Two of these bases are directly connected to basements, another is in the main sewage hub under Firannia’s Main Square, and their main base of operations is in the biggest cavern. Sir Gallard’s explorers also found some tunnels that slant downwards and seem to continue deeper and deeper; those tunnels were not explored further. The Others are a dangerous criminal guild with enormous influence in the big city of Firannia. Adventuring parties can work for or against them in multiple ways. In case the party is working against the criminal guild, then Sir Gallard (Knight, Monster Manual, page 347) can give the adventurers the map of the underground network he has, which is illustrated here. Working against The Others is a very dangerous business, one that can hardly be solved in a day. The Others have a lot of goons and resources and the underground network is so vast that there is enough material for many sessions of play. It is up to the DM to determine what will be the point of entry to the underground system. There are uncountable entries, most sewer grates in the main streets give access to the main sewage lines. Two sewage lines end up at the sea and are accessible there. If the party finds access to the exits of the three tunnels that leave the city that is a different way to enter. Finally, several basements in town are directly connected to the cave system or the sewers. All the basements are below houses or buildings controlled by the Guild. There are usually a few Drow (Monster Manual, page 128) and Kenku (Bolo’s Guide of Monsters) on watch duty in the safe-houses. The biggest caverns and drow bases are protected with Ogres (Monster Manual, page 237), Drow (Monster Manual, page 128) and Drow Elite Warriors (Monster Manual, page 128). Lady Knuckles is a Drow Priestess of Lolth (Monster Manual, page 129).